The Fifth All-American Council held in Montreal, Quebec, Canada on October 25-28, 1977 was the only one to date to assemble outside of the United States. By virtue of its location, this council more than any other reflected the multinational character of the Orthodox Church in America. The designation of Montreal as the venue of the council also gave considerable moral encouragement to the Orthodox Church in Canada, whose historical development differed from that of the Church in the United States due to a distinct cultural environment. In March 1977, as the council was in its final planning stages, Metropolitan IRENEY, who had been in failing health for some time, announced his retirement as Primate of the Orthodox Church in America effective upon the election of his successor. Suddenly, intense additional planning was required so that the first day of the Fifth Council would be devoted to the selection of the new Primate of the Orthodox Church in America. Some, especially in the Orthodox Church in America’s Archdiocese of Canada, expected that Archbishop SYLVESTER (Haruns) of Montreal, who had served as Temporary Administrator of the Orthodox Church in America since 1974 due to Metropolitan IRENEY’s deteriorating health, would be elected Primate of the Orthodox Church in America in his own diocesan cathedral. However, the election proved to be quite different. Following the Divine Liturgy and opening prayer service, only delegates remained in the Cathedral to vote. As mandated by the Statute of the Orthodox Church in America, each delegate initially wrote one name on his ballot. In the first vote, Bishop DMITRI (Royster) of New England received 278 votes, a mere 30 votes shy of two-thirds. Other hierarchs lagged very far behind. As this first vote did not produce a two-thirds majority for any hierarch that would designate a sole candidate for confirmation by the Holy Synod of Bishops, a second round of voting immediately took place. In the second vote, each delegate was required to designate two names on his ballot. Following the announcement of the results of the second vote, the Holy Synod retired to the sanctuary to select the Primate from the top two choices of the delegates. In the second round of voting, Bishop DMITRI received 348 votes and Bishop THEODOSIUS (Lazor) of Pittsburgh had 179. The hierarchs deliberated briefly then elected Bishop THEODOSIUS to be the new Metropolitan of All America and Canada. The assembled delegates joyfully received this news. Following a Grand Banquet that night honoring both the retiring Metropolitan IRENEY and the newly elected Metropolitan THEODOSIUS, the council turned to other matters in sessions which commenced the following day. Due to the selection of the first American-born Primate of the Autocephalous Orthodox Church in America, the council continued in a very jubilant mood. The council was also spiritually uplifted by the news that Saint INNOCENT (Veniaminov), Enlightener of the Aleuts, had been canonized in Russia earlier that month and had thus become the second North American Orthodox saint. Following the precedent set by the Fourth Council, this council also had a theme, “STEWARDSHIP,” to focus its discussions. In deliberating this issue in both its spiritual and financial dimensions, the council decided to establish a Department of Stewardship to bring this subject to the forefront throughout the Church. A major new aspect at this council was the first-time participation of official observers, including women. The Fifth Council was the first to be attended by Bishop KYRILL (Yonchev), who along with the Bulgarian Diocese, had been received into the Orthodox Church in America in 1976. Seeing this as another step towards Orthodox unity, the council joyfully welcomed him and representatives of his diocese. 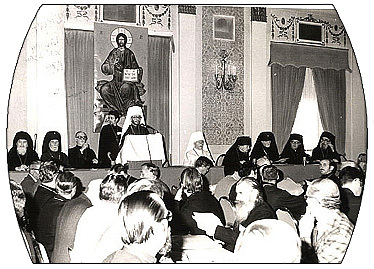 It was decided to convene the next All-American Council in 1980 rather than 1979 in order to coincide with the 10th anniversary of autocephaly. This council clearly continued the integration of the Orthodox Church in America into contemporary North American society undertaken at the Fourth Council. Addressing the subject of stewardship, which had a blatantly non-Orthodox resonance for some at that time, was a courageous endeavor. Its subsequent full integration into our ecclesiastical vocabulary has shown an understanding of the concept throughout the Orthodox Church in America. However, the most significant accomplishment of the Fifth Council was the election of American-born Metropolitan THEODOSIUS who, in the twenty-five years since then, has been able to lead the Orthodox Church in America as Primate to a fuller integration with the culture of the continent where she resides and which she is called to evangelize. His election truly inaugurated a new era in the history of the Orthodox Church in America.